↑ "Calling all taxonomists". Science খণ্ড 307 (5712): 1021. 2005. doi:10.1126/science.307.5712.1021a. http://www.sciencemag.org/cgi/reprint/307/5712/1021d.pdf. 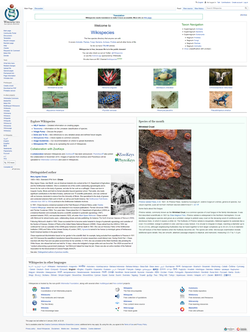 ↑ "WikiSpecies". American Scientist Online. 25 April 2005. http://web.archive.org/web/20050430034914/http://www.americanscientist.org/template/SiteOfTheWeekTypeDetail/assetid/43122. ↑ Mark Peplow (2005). "Species list reaches half-million mark". Nature. doi:10.1038/news050314-6.